Modern Taiwan is a mixed bag of many different ethnicities, cultural influences, traditions and histories. One of the uniting factors that brings people together however is that of the deep-rooted spiritual and religious traditions practiced by the people of this country. As a traveller, whatever preconceived notions you may have about 'tourism' and 'religion' typically aren't applicable while you are visiting Taiwan. No one is going to proseltyze to you or try to convert you nor will you be hit up for offerings or donations. Spirituality in this country is your own personal business and people are extremely tolerant and respectful of others. Conflict is something that seems almost unimaginable making the spiritual experience in Taiwan unlike any other. While in Taiwan you could either find yourself sitting on top of a mountain listening to the humming of Buddhist chants while drinking tea or walking in the middle of an extremely loud procession of drum-beating trucks where fireworks and firecrackers are being set off mere meters away from you. The people of Taiwan are polytheistic and for the most part practice a blend of Buddhism, Taoism and Chinese Folk Religion. Thanks to democratic reform over the past few decades, religious diversity is a protected right giving the people of this country the freedom to practice any faith they choose. With an estimated 30,000+ places of worship throughout the country, you would think that it would be difficult to choose a handful that stand out above the rest, but that actually isn't the case. The 'big' temples found throughout the country are easily identifiable and often share a rich history with the immigrants who settled here centuries ago making the country the place that it is today. Taipei, the capital city of Taiwan is a modern metropolis and one of Asia's leading economic centres. The city has developed at an amazing rate over the past few decades becoming a high-tech industrial city which also pays respect to the beautiful mountains and nature that surround it as well as the history that has made the city what it is today. In terms of temples, the city is well-known for its so-called 'Top Three' temples (台北三大廟門) which are cultural relics that date back hundreds of years. Today these places of worship are jam-packed with the faithful as well as tourists who visit to learn more about Taiwan's unique cultural and religious heritage. When it comes to the Top Three temples of Taipei there is a bit of inconsistency in both the Chinese-speaking world as well as that in the opinion of foreign visitors as to which temples actually belong on the list. While others may disagree, my list will take into consideration what the majority consider the 'Top Three' but I'll also include the temples which often make the list as well as provide links to my posts about each of the temples for further details. Bao-An Temple is the unanimous top-pick on all of the lists for Taipei's 'Top Three' temples. The temple has been recognized by the UNESCO Asia-Pacific World Heritage Awards for Cultural Heritage Preservation and is a Taiwanese national treasure. The temple has a history that dates back to 1742 and is intertwined with the lives of Hokkien (閩南人) immigrants who settled in Taipei and started to develop the city several centuries ago. 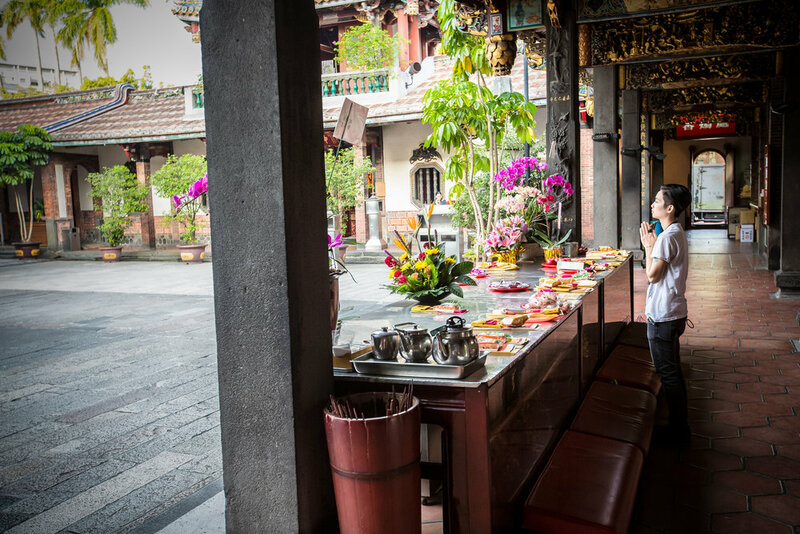 Bao-An Temple should be high on the list of locations for a travellers itinerary while visiting Taipei and a visit to this temple in conjunction with Taipei's Confucius Temple (台北孔廟) will prove to be a highly enjoyable experience. Longshan Temple is probably Taiwan's most well-known temple - The temple is one of Taiwan's busiest places of worship and is always jam-packed with tourists who come to view this beautifully designed and well-preserved temple. The temple has a history that dates back to 1738 and like Bao-An temple, also has a close relationship with the Hokkien immigrants who came to Taiwan several centuries ago. 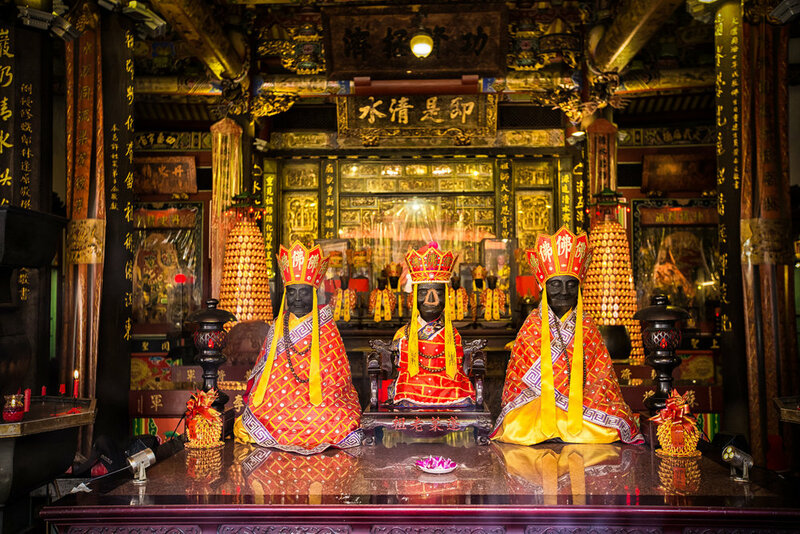 Longshan Temple is primarily dedicated to Guanyin (觀音菩薩), the Buddha of Compassion, but like many other places of worship in Taiwan has shrines set up to Taoist and Chinese Folk Religion deities making it a very convenient temple for the faithful of Taiwan. When it comes to design, this temple is second to none and is one of the most beautiful specimens of Chinese-style temple architecture in Taiwan, if not the whole world. While Bao-An Temple and Longshan Temple are always on the list of the 'Top Three' temples, Qingshui Temple seems to be the one that is 'questionable' as to whether or not it belongs on the list. This isn't to say that this temple isn't amazing or that its history, which dates back to 1787 isn't as impressive - It just isn't as busy as the other two temples which often make the list nor is it as tourist friendly. Qingshui Temple, like Longshan and Bao-An Temple shares a history with the Hokkien immigrants who settled in Taipei several centuries ago. The temple is dedicated to Master Qingshui (清水祖師), a popular Buddhist monk and folk-hero whose worship was imported to Taiwan by immigrants from Fujian province in China. The temple makes the list as one of the 'Top Three' due to its age and the important relationship it has played throughout history with a specific group of immigrants who have made the Bangka (艋舺) district the special place it is today. The Xia-Hai City God Temple is one of the temples that is often placed on the list of the 'Top Three' temples of Taipei and is clearly deserving of such an honour. The temple which is now over 160 years old is an important place of worship for the people of Taipei but unlike the other temples on the list, it has never been rebuilt. The temple that you see today is pretty much the same one that you would have seen back in 1859 when it was originally constructed (with a few additions and renovations of course). The temple is one of the busiest places of worship in Taiwan and is also a major tourist attraction, especially with tourists from Japan who visit hoping to find luck in love with the temple's extremely successful match-making god Yue Lao (月下老人). 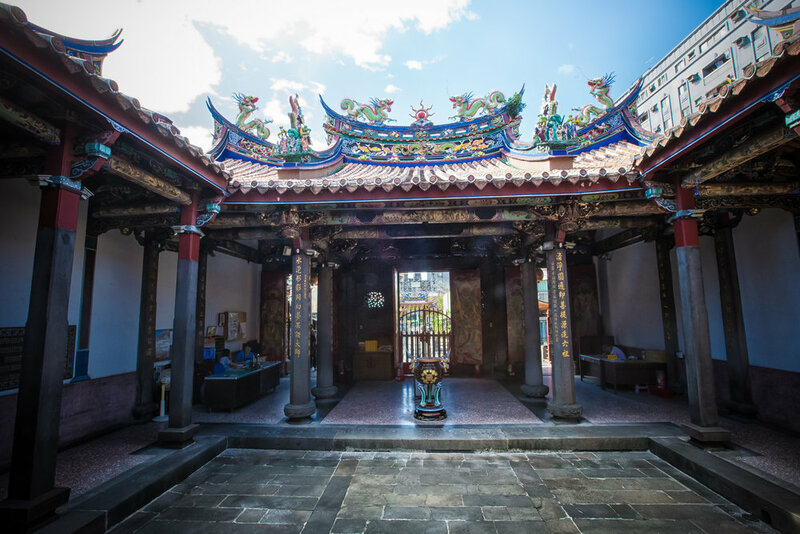 While this temple is not as large as some of the others on the list, the history that it shares with the development of the Dadaocheng (大稻埕) area of Taipei as well as the complicated turf wars of the 19th century helped to shape the city into the place it is today. Xingtian Temple is one of the temples that also often gets added to the list of the 'Top Three' temples in Taipei. Built only a half-century ago, the temple is not even remotely close in age as some of the other entries on the list, but don't let age fool you, the significance of this young temple cannot be understated. The temple is visited by an estimated 10,000 people each day and even though it has a short history it has become a major place of worship and also an important attraction for tourists who are visiting the city. Due to its age and the lack of centuries old traditions, the temple has made waves within the spiritual world in Taiwan with its efforts to reduce its carbon footprint by banning the practice of burning paper or incense in the temple which has endeared itself to the local population which just needed a push in the right direction!